Many people want landscaping that involves water features. These are beautiful and soothing; the sound of water helps people relax. BDI Outdoor Solutions installs and maintains many types of water features for residential and commercial properties around the Twin Cities metro area. We have many water feature options and price levels to choose from, depending on how simple or extravagant you want to go. Not only will we install a water feature at your home or business but we will design it for you, too. This way your new water feature will fit seamlessly into your existing landscaping. And if this is a full yard landscaping project, we can include a water feature with gardens, garden bridges, retaining walls, pergolas, and any outdoor living space. Just pick up the phone and we can meet with you and get started on designing and installing the right water feature for your yard. These are just a few of the water feature options that we have at BDI Outdoor Solutions, but they are by far the most popular and sought-after. Now, although these are the main options, this is just the beginning. Deciding to have a pond built, for instance, opens you up to many different styles and types of ponds to choose from. They can be combined with waterfalls, streams, they can collect from fountains and cycle the water through – deciding to have a pond is just the tip of the iceberg! And the same goes for aqua gardens, fountains, waterfalls and pondless waterfalls. When you have BDI Outdoor Solutions handle the water features on your property, you will get many, many choices, as well as superb quality, and on time construction. Aquatic gardens are great for people who want garden and water features in their yard. After all, an aquatic garden combines the two! They’re the best of both worlds. Aquatic gardens can features many different grasses, lilies, flowers and more. And when you choose to have an aquatic garden for your home or commercial property, it can be incorporated with other water features so that the entire landscape area feels like one seamless piece. Fountains are very common water features used on both residential and commercial properties. For residential properties, it is typical to find them both in the front of the house and as part of other backyard landscaping. There are many options to choose from with regards to fountains, from large architectural fountains with angels and collecting pools to small bubbler types that run off into pondless collection zones. Combined with our skills in custom paver construction and retaining walls, you have many options when it comes to fountains and collecting pools, both large and small. 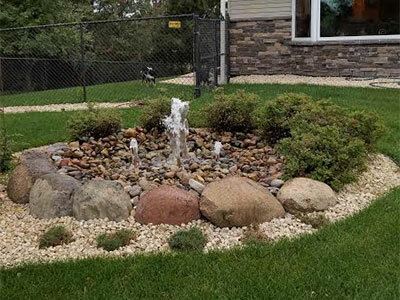 Give us a call and we’ll set up an appointment to discuss with you what type of fountain and other water features you want for your home or business property in Minnesota. As mentioned previously, there are many options for ponds. At BDI Outdoor Solutions, we can design and build virtually any style of pond you have in mind. Whether for commercial uses or residential, our ponds can take on a wide variety of looks and feels. Say you are looking for a koi pond? We can do that for you. Just let us know what you want and we’ll take it from there. Ponds are often used as a collection tool for people who want a waterfall in their backyard or at their commercial location. BDI Outdoor Solutions constructs many waterfalls and accompanying ponds for people around the Twin Cities metro and Minnesota. But another option that has gained much popularity are pondless waterfalls. The concept is the same for the most part, except that there is no collecting pond for the water to drain. Instead, the water runs off into beautiful gravel or stone and disappears. So whether you want a collecting pond or disappearing water, we can build the type of waterfall that you are looking for. BDI Outdoor Solutions constructs many types of water features for people around the Twin Cities metro area. We have many to choose from and will design whatever you are looking for so that it fits seamlessly into the rest of your landscaping. Give us a call today and let’s get started.